Singapore’s demographic and socio-economic landscape has changed substantially in the last 10 years. Striving to balance between meeting space constraint challenges and fulfilling the needs of passengers, Land Transport Authority (LTA) has involved itself in various projects. These include the fleet expansion of trains for the North-South and East-West lines to improve efficiency, as well as tunnelling works for the Thomson-East Coast line. With LTA’s increasing involvement in large-scale engineering projects, there has never been a more opportune time to take up the challenge of joining them. LTA Overseas Scholar Jonathan Lee tells us about the opportunities he has received with LTA. As a Project Engineer, he shares, “In my line of work, I learn about the subsystems – such as the brakes, traction, suspension, air conditioning – of a subway train and also apply my engineering knowledge to tackle problems with the trains”. 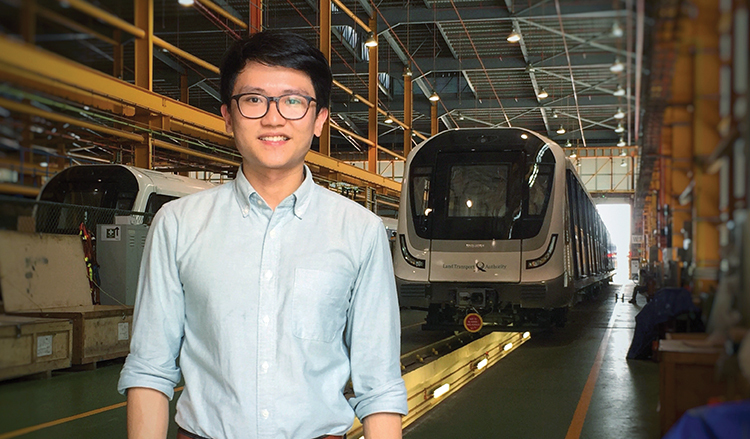 Jonathan decided to pursue the LTA scholarship because transport issues are of a prime concern in a highly-connected Singapore and the prospect of approaching a nationwide concern greatly appealed to Jonathan. He was given the opportunity to pursue Mechanical Engineering at the prestigious Cambridge University in the UK. He shares that the experience of studying overseas is invaluable as it allows one to gain independence, and provides one with the experience of being immersed in a foreign culture. Today, Jonathan fulfils his Project Engineer duties in Rolling Stock under the Rail department. He admits that he had to mount a steep learning curve, given the necessity to get up to speed with technical train issues as well as operational knowledge. To counter challenges, he remains open to new experiences and asks questions when in doubt. Hardly desk-bound, Jonathan also points out that his work is largely based at the project site of MRT depots, and as such, being adaptable is key. Are you an environmentalist or nature lover? Read what NEW Scholars Low Guan Jie and Fabia Lim have to say about how their roles ensure Singapore remains a clean and green garden city.